The ES-185F/PTP is a GPS Master Clock/Time Code Generator and IEEE-1588 PTP/NTP Time Server. The unit receives accurate time and date information from Global Positioning System satellites and displays nine digits of time (Day of Year, Hour, Minute & Second). 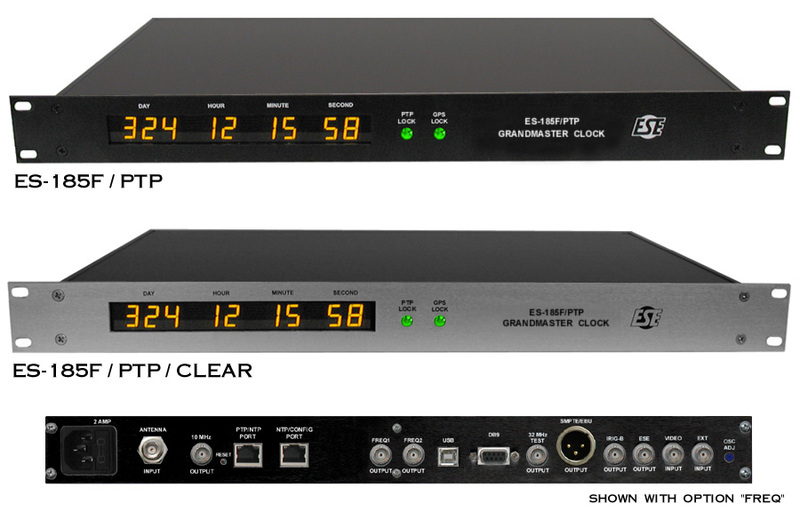 Simultaneously, the ES-185F/PTP generates several types of time code including SMPTE/EBU LTC, ESE-TC90/TC89, ASCII (RS-232C & USB), IRIG-B and a 1PPS signal. These outputs allow the ES-185F/PTP to easily interface with new or existing computers, automation and clock systems. A 12-channel receiver is employed that is capable of tracking up to twelve satellites simultaneously, although reception of only one is required for time data to be output. ESE's ES-185F/PTP offers an accuracy of better than 10nS, and is entirely self-setting. The unit provides an internal Coin Cell for backing up the GPS receiver time. Software supplied with the ES-185F/PTP permits users to continuously update a computer's Windows' clock to the time available on the USB port. Other features allow the user to select SMPTE mode (DF, NDF, EBU & Real Time), offset the Time Zone displayed and output by the ES-185F/PTP and advance or delay the time output for various synchronizing purposes.